A pair of surf scoters fly in front of Old Barney. The beaks of the birds mimic the colors of the lighthouse. In the foreground, the black male scoter is distinguished by the white patches on his forehead and the nape of the neck. His most distinctive feature is his bill. It has a black patch on each side margined behind by red, above orange, and in front and below by a patch of white. The female scoter is dark grey with a grey bill. These duck stamps are unique for two reasons. First, each year’s stamp design is chosen in the nation’s longest running open art contest. Secondly, it is the only congressionally mandated wildlife art competition. Goebel’s particular stamp was more distinctive because of Old Barney. This was the first time a specific lighthouse was ever featured on the stamp. The Federal Duck Stamp Act, formerly known as the Migratory Bird Hunting Stamp Act, was signed into law in 1934 when our country was experiencing horrendous dust bowls. The country was losing wetlands and waterfowl. President Franklin D. Roosevelt took an important step to address this loss by signing the Duck Stamp law to strengthen the National Wildlife Refuge system. This allowed the Refuge System to grow exponentially over the next decade. With the application of scientific and increasingly modern wildlife management techniques, waterfowl populations began to rebound. 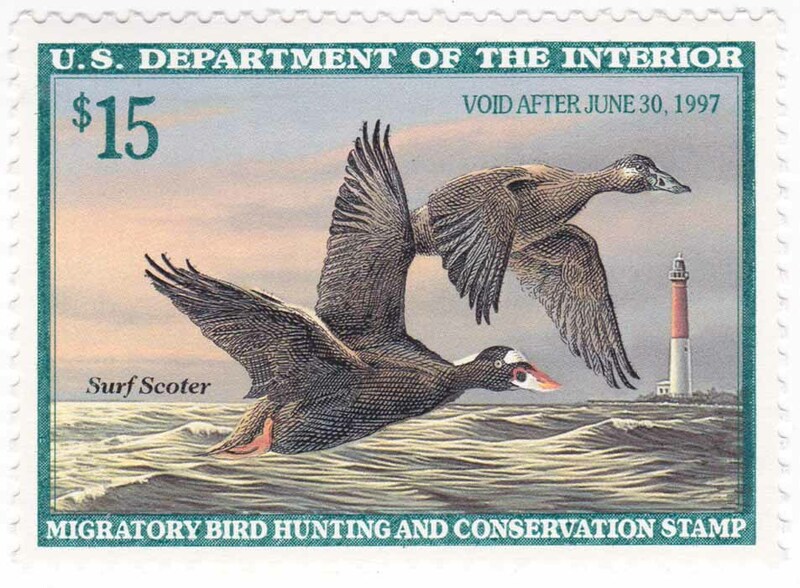 The Federal Duck Stamp became central to bird conservation during this vital period. The Federal Duck Stamp is required yearly of waterfowl hunters. Hunters need to have one federal stamp plus a state stamp and license. So why should you care if you are not a duck hunter? Ninety-eight cents of every duck stamp dollar is used for acquiring wetlands habitat for the National Wildlife Refuge System. To date, more than $800,000 has been raised from these sales. These funds have been used to protect more than 6.5 million acres of habitat. Little wonder the Federal Duck Stamp Program has been called one of the most successful conservation programs ever initiated. Birders, photographers and conservationists purposely all buy the Duck Stamp but they can be purchased by anyone. In doing so, they are helping to acquire and protect important areas for birds and other wildlife. The Duck Stamp is an annual pass for free admission to any national wildlife refuge. Additionally, stamp collectors collect these beautiful pieces of art. The Duck Stamp art contest has been running since 1949. Any US artist over age 18 can enter. It is prestigious and competitive and took Goebel ten years before he won. There is even a Junior Duck Stamp contest for the younger artist. So, all of you artists out there, go to the federal wildlife site and enter!